I’ve met a lot of doctors whom I admire, due to their intelligence, listening skills, willingness to collaborate, and their ability to have the occasional hearty laugh. Recently Veronica Kaninska, Certified Therapeutic Recreation Specialist, introduced me to a Doc I instantly fell in love with. I went on rounds with Veronica and Dr. Moody, who often works with people who are living with dementia. I was so impressed with his knowledge of each individual and the warm way he offered his services. His first patient lit up when he and Veronica strolled toward her. "How are you today?" he asked in a friendly avuncular voice. "Dr. Moody is here to check your mood. Are you feeling happy?" "Yes, Dr. Moody, I'm happy now that you're here." "Let me check your smile." She smiled broadly and Dr. Moody nodded approvingly. "Good. Your eyes are sparkling. I hope you keep your happy mood all day." "I will Dr. Moody, I will." We continued with Dr. Moody checking on some more patients. Each one enjoyed his company and he promised to come again and check on their moods. 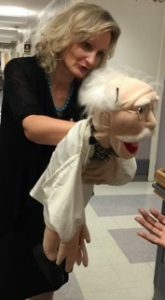 After rounds, Veronica slid Dr. Moody off her arm and hung him near another popular puppet, Froggie, who she also uses for therapeutic purposes. "People who are living with dementia often feel very comfortable communicating with puppets," Veronica says. I wondered if Dr. Moody was open to new patients and Veronica assured me he was. Click here to meet the good doctor. "Puppets break down barriers,” Veronica says. "They have no religion, no gender, and no judgment. 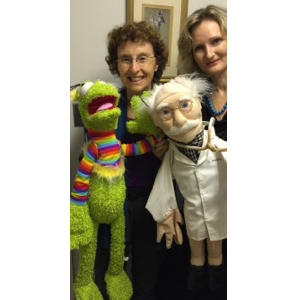 People living with dementia often feel comfortable confiding in a puppet." In a space of three to five minutes, I saw Veronica and Dr. M transform the energy of the people they visited. I asked Veronica to share a few tips for using puppets. 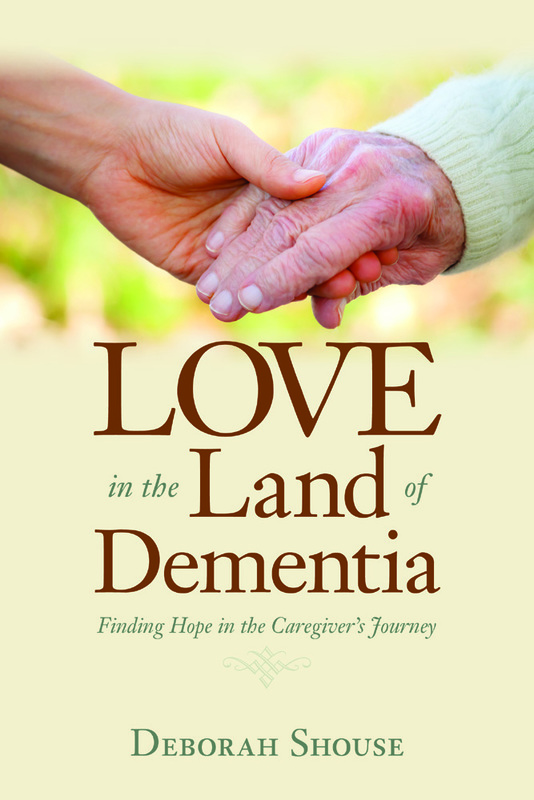 If you'd like to know more about Veronica and her work, read her chapter in Connecting in the Land of Dementia.